“Without doubt Dr Peter Forsyth’s book is one for contemporary preachers. The writer himself was a grand preacher of the great eternities, but he spoke the language of his day and brought the realities of the gospel to his listeners and readers with power. His primary emphasis was upon the nature of God as holy love, and he saw such love displayed in the Cross. At heart he burned with passion for the Atonement. More correctly, it was the Atonement which evoked such passion within him. His many books throb with this strong response to God’s grace. He says of himself, ‘It pleased God by the revelation of His holiness and grace which the great theologians taught me to find in the Bible, to bring home to me my sin in a way which submerged all school questions in weight, urgency and poignancy. 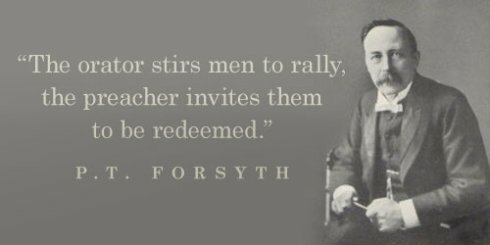 I was turned from a Christian to a believer, from a lover of love to an object of grace.’ It is this sense and understanding of grace which pervades Forsyth’s writings.